This essay was originally published on B the Change. Best for NYC is an initiative of the New York City Mayor’s Office of Workforce Development in partnership with B Lab. Sheila McQueen, owner of Scrub Clean Maintenance, presents to the rest of her cohort at a Business Peer Exchange session. When it comes to economic development, we most often find ourselves measuring the number of businesses started, revenues realized and jobs created. Rarely, however, do we discuss what kinds of businesses are launched, where those revenues go or the quality of those jobs. 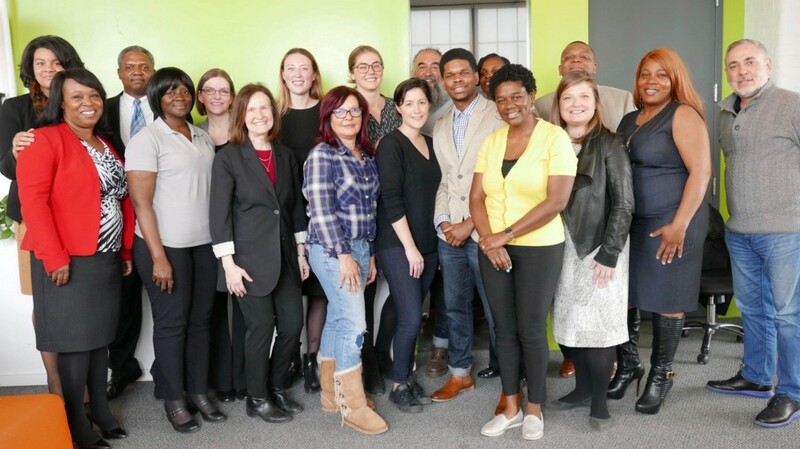 In April, the Bronx Collaborative celebrated the graduation of its first cohort of 11 business owners from a six-month learning process called the Business Peer Exchange. The experience allows participants to learn from each other, unlocking the knowledge and wisdom that these leaders have built over their cumulative 350 years in business. 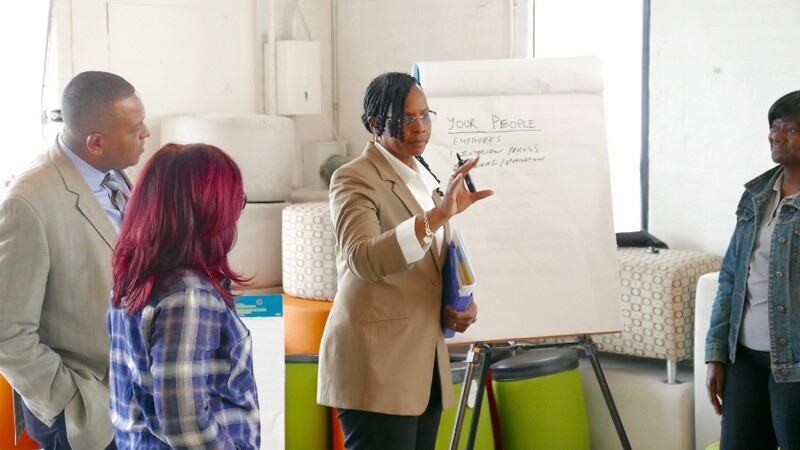 This first cohort was made up of owners of women- or minority-owned Bronx businesses, including cleaning services, food manufacturers, office suppliers, and construction and contracting companies. The Business Peer Exchange process, facilitated by change management consultant Hector Marcel, allows participants to examine their business practices along four angles: employees, customers, finances and operations. Participating business owners use tools from B Lab, including the B Impact Assessment, to assess their business practices. 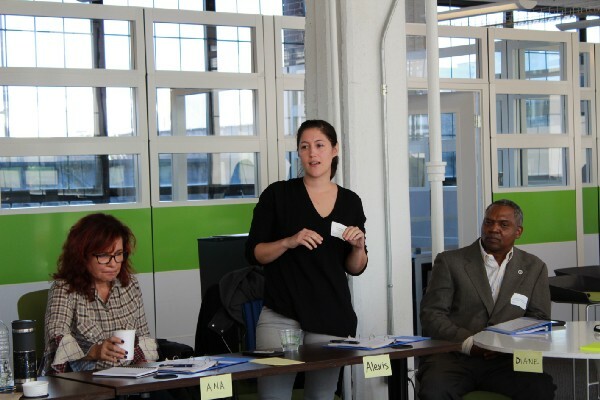 With feedback from peers and consulting from the Bronx Collaborative’s change management team, business owners identify strategies to improve outcomes for those four focus areas. As they create plans for growth and change, business owners also keep in mind the three P’s of the triple bottom line: people, planet and profit. The Business Peer Exchange dedicates a lot of time to the people part of the equation, especially the employer-employee relationship. What has emerged from the conversations among the participating business owners is that, very often, investments in people can result in increases in profit. The first cohort of the Bronx Business Peer Exchange includes 11 business owners with a cumulative 350 years in business. April’s culminating event was attended by business owners and business service providers from all five boroughs, as well as representatives from the philanthropic community. At the event, one business owner described how the Business Peer Exchange helped him rethink how he managed his employees. Calvin Thomas owns PostNet133, a business with two locations in the Bronx that offer marketing, shipping and printing services. “I have a lot of young employees who are in their early 20s, and that’s one of the things I’m most proud of,” says Thomas, who believes that his employees’ customer service and commitment to their community is what gives him an edge over his online and big-box competitors. In keeping with his interest in fostering the leadership of his young employees, Thomas invited staff member Lyndon McCray to join him in the Business Peer Exchange program. McCray was particularly interested in the framework of “employee feeling states” that the Peer Exchange participants discussed with facilitator Marcel. “Volunteers” feel good about themselves and their work. “Casualties” are connected to their work but do not feel supported or recognized personally. “Survivors” are confident in their own value but do not engage with the work or the company’s mission. “Prisoners” feel trapped in a job they do not value but cannot leave for various reasons. Thanks to the Business Peer Exchange, McQueen realized that she could better serve her 11 employees and grow her business if she refined her employee policies and procedures to reflect her expectations and values. With assistance from the change management team from the Bronx Collaborative and the advice of her peers in the Business Peer Exchange, she set about gathering intentions, habits and informal practices into a more coherent whole that she could share with her employees. With these in hand, McQueen plans to offer more training and give her employees more responsibility over time. 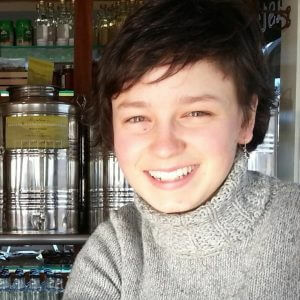 She realizes that having a more independent workforce will allow her to focus more on the business’s growth. In fact, the growth for Scrub Clean has already begun. Through the Business Peer Exchange, McQueen learned about the large business opportunities that the anchor institutions of the Bronx (such as hospitals and schools) can afford a business like hers. Too small to bid on such jobs by herself, McQueen plans to partner with other business owners she met in the Business Peer Exchange to apply for those big contracts. Like Scrub Clean, the growth strategy of ISE Office Plus (ISEOP) is inextricable from its focus on employees. ISEOP is a locally owned office supply business in an arena dominated by bigger, often online companies. In such a competitive environment, its leaders have found — perhaps paradoxically — that investing in cooperation and strong relationships is their best strategy. These impulses have shown up in a few ways. In 1992, ISEOP joined the national business products buying cooperative Independent Stationers to improve its bargaining power so it could continue to offer customers the best prices. In 2014, the two founders of ISEOP decided to sell the business to four of their longtime employees. Business Peer Exchange participants speak during a session. The company’s current leader, Kerri Damon, was part of the same Business Peer Exchange cohort as McQueen. The program has helped Damon think through ways to build on ISEOP’s strengths by further expanding employee engagement. She is confident that empowering employees to take more responsibility in account management will allow ISEOP to take on new clients. Also through the Business Peer Exchange, Damon was introduced to BronXchange, which is an online platform that connects Bronx-based anchor institutions and nonprofits to Bronx-based vendors, ensuring that Bronx procurement dollars stay local to build community wealth. The BronXchange platform helped ISEOP to land a contract to provide office supplies to a large warehouse and distribution facility in Hunts Point, as well as Bronx-based nonprofit organizations such as the New York Botanical Garden, BronxWorks and SUNY Maritime College. But Coleman’s participation in the Bronx Collaborative’s Business Peer Exchange has changed that. “It’s great to come out from behind your computer and to share insights with other business owners,” says Coleman, whose architecture and interior design business is in the midst of a significant growth spurt. Business owners are rarely able to participate in the kind of deep transformational process that the Business Peer Exchange provides. A flexible facilitation style allows each participant to engage and learn in their own way, taking away the lessons that they need most. For Coleman, the revelation was that it is all right to show vulnerability. As a woman of color in a business still dominated by men, she has always felt the need to show strength. 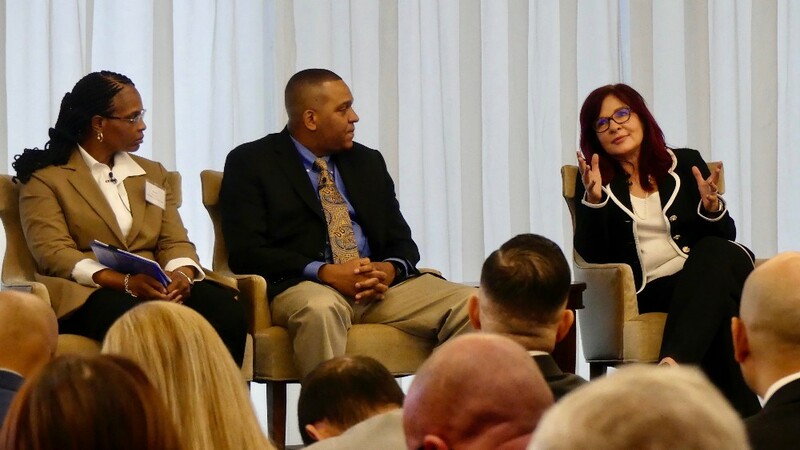 But over the course of the Business Peer Exchange process, Coleman says, participating business owners grow to trust each other and begin to feel comfortable showing vulnerabilities and solving problems together. Ana Lavdas, right, speaks about her experience in the Business Peer Exchange, alongside her peers Sheila McQueen and Calvin Thomas. Openness and collaboration are not always the modus operandi in the business world, but these are some of the values held most dearly by the Business Peer Exchange. The shift in mindset from competition to cooperation can lead to breakthroughs for small businesses. For example, Diane Moore is the owner of CleanWork Solutions, a certified NYC Minority and Women-Owned Enterprise. 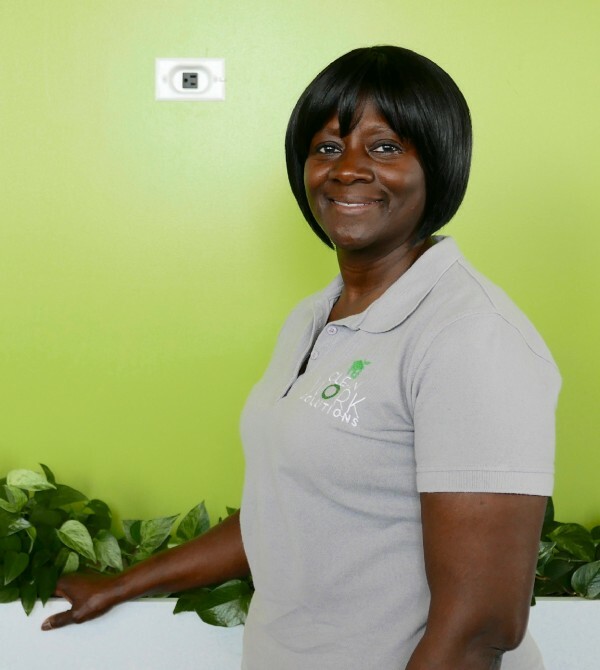 Through the Business Peer Exchange, Moore discovered that she could build her service capacity by teaming with other commercial cleaning companies that are part of the online BronXchange platform. By coordinating their efforts, these Bronx-based cleaning companies can meet the needs of larger institutions and bring in bigger contracts than they could by themselves. Diane Moore, owner of CleanWork Solutions, plans to work with members of her cohort to go after bigger cleaning contracts and grow her business. In another example, thanks to technical assistance from BOC, AAL Construction Services was recently awarded prequalification status for ConstructNYC, which opens up opportunities to work on New York City Economic Development Corporation projects. Lavdas is exploring how to bid for these projects together with other members of the Business Peer Exchange. Each project is too big for one firm alone, but by working as a group they will be able funnel the benefits from these projects back to the Bronx.